If you are a basketball lover, and wants to fill your backyard or home with a portable basketball system, then in my opinion, the best brand to be trusted for such sporting equipment is none other than Spalding. 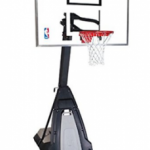 The day it was found by Russel LLC, Spalding has developed its reputation of creating immensely impressive basketball goods in which portable basketball hoops are its widely recognized and most used invention. 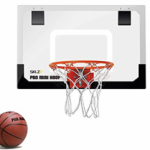 Spalding has a vast variety of portable basketball hoops and if you are looking for a product that hasthe ability to increase your skill level, then without having a second doubt Spalding NBA Portable Basketball System 60” acrylic backboard is best for you. Been constructed with creative mind, this system by Spalding is one of the high est qualities across the globe which comes in a comparatively expensive price but gives a good value of money. 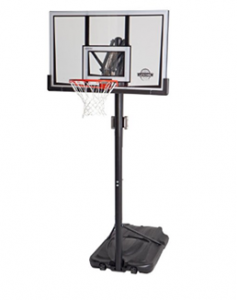 This Spalding portable basketball system is perfect for the ones who want to take their game up to the professional level. This product is accessible for people having different age and skills. 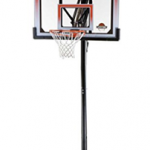 Spalding is one of the leading brands in NBA franchise and very trusted across the globe. The Spalding 60 -inch acrylic backboard consists of a rigid frame and beefy thick backboard which is covered with aluminum for outdoor plays. The performance of Spalding backboard acrylic backboard satisfies and fulfills the need of majority of athletes and players out there. 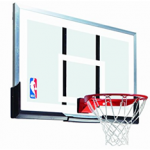 Well, if you are still looking for a backboard with much higher quality than acrylic, the in that case, you have to go for a backboard which is not really pocket friendly but is made of immensely astonishing quality and is used mostly in NBA games and that is a tempered glass backboard. The backboard has a 16-inch workspace which provides enough room to play under the rim. With arena slam unbreakable rim, it comes with a wraparound support to handle hard plays. The screw jack lift system is used to adjust unlimited height with just turning the crank which is situated behind the system. Having an adjustable height feature, the system is comfortable for players of different age and skills. The Spalding 60-Inch Portable Basketball System hasthe base capacity of 40 gallons.The Spalding base consists of an ultimate hybrid system which can hold up to 19 gallons of water and 200 pounds of sand in the central department hence eliminating to add extra weight on the base. A lid which is easy to remove, is used to add or remove sand bags. It is recommended to add some time of antifreeze in it if you are filling the base with water to prevent freezing during colder months. Assembling remains the main concern in most of the portable basketball systems because it takes a lot of time and work. 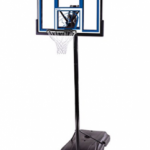 The Spalding 60-inch basketball hoop, requires at least two people to completethe setting up process easy and quick. The hoop nearly takes three to four hours as said and experienced by professionals. It is recommended to read the instruction manual very carefully, when it comes to the pole which comes in three pieces. It is recommended to doproper assembling because at the game play they may trip or vibrate after facing heavy shots. 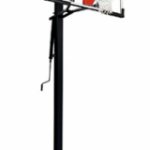 There are three pieces of support pole provided in Spalding 60-inch portable basketball hoop. The poles consist of a diameter of 3.5 inches. Whereas, finding athree-piece pole hasbecome very common in portable basketball systems but most of them have faced theissue of vibration while hittingpowerful shots. In Spalding 60-inch there is also some vibration present but that is very minor and certainly tolerable. However, if you want a system with a pole giving zero vibration then that higher quality pole will be found in Spalding “The beast”, which consists of a square two-pieced supporting pole. The Spalding pro-style breakaway rim comes with a high quality rig that uses high intensity spring compression to balance the rim and join it withthe backboard. With that thing, the hoop hasless chances to break during heavy dunking and thus it gives a more natural feel just like you get in a gym. Though, it is not necessary, every time to go for dunking as it may sag your rim. Then in such cases, buying a new spring is the only option left to maintain the rim in a fresh condition. 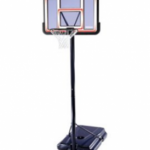 This basketball system is very portable which comes with a 60-inch acrylic backboard. Consists of pro-style breakaway rims having high density steel framing. The height is adjusted through screw jack lift system in a range between 7.5 feet to 10 feet with an unlimited increment. The pole comes in three pieces having a3.5-inch dimeter. The front of the pole works as a good rebounder. The base hasthe capacity of 40 gallons, which can be filled with either sand or water to give maximum stability. 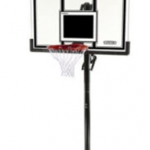 In my opinion, the Spalding NBA Portable Basketball System with 60-Inch Acrylic Backboard is a very high quality professional product which gives a very good value. From packaging to usage, I was completely satisfied with this basketball hoop. The package arrived within a week and came in a very fresh condition.Assembling the hoop remained a very difficult job for me in previous basketball hoops, but not in this. The instruction manual was very brief with pictures and I easily assembled the system within 6 hours by taking the help of my father. I filled the base with sand because I think that will give more stability and reduce the excessive three-piece support pole, which it did. The backboard and breakaway rim was very sturdy and was easily handling my heavy shots, dunks and layups. With wheels attached on the base, I was able to move the system in my yard very easily. The design and looks of the system were very overwhelming which lead me to practice on itquite often. Overall, it’s a very good purchase and is recommended for everyone. Acrylic backboard works really well by giving a low impact bounce and showing extensive rigidity. The padding increases backboard safety even further and makes itapplicable to withstand powerful shots. The base is big enough to make the system stable enough. Screw jack lift system is very easy to operate by anyone from teen to adult. The breakaways protect the hand of players while dunking. This product is designed with respect to official NBA rules and dimensions so it’s a bit expensive. The round three piece pole vibrates a lot after facing powerful shots. Breakaway rim may sag after excessive heavy dunking.